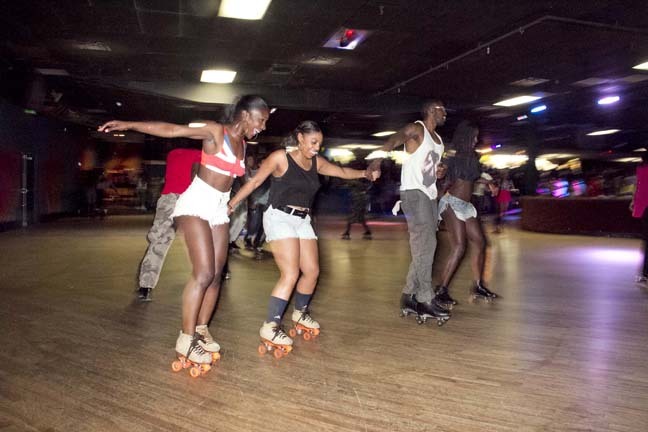 On June 23, up beat tunes blast over the loud speakers as lights flicker here and there from strobes and camera flashes, but all the smiles and laughter fail to cover the somber mood of the lifelong skaters some of who, donned their first pair of skates here. Now, they are skating around the brown, linoleum rink for the last time spinning and jumping in simultaneous celebration for and protest against the closing of the skating rink known as World on Wheels. It was shortly after midnight when the house lights begin to illuminate the 32 year old skating rink and the wear from those many years became as clear as the tears on the general manager’s face as she approached the DJ booth just after the DJ‘s last song winded to an end. Even though they listened to the words, most seem to be in denial as they refused to stop their skates from spinning and rebuffed any acknowledgement of the closing of another land mark in the black community. Some people, who skated joyously throughout the evening, now stood, huddled, visibly weeping, as if they mourned the passing of a longtime friend. Statements like, “I grew up in this place,” and “I learned to skate here,” became more commonplace as the oval rink emptied and the skate-return area filled with people. It was as if the wooden racks that held the skates represented the final mass acceptance of the ultimate fate of AMF Lanes and World on Wheels, one skate at a time. Even as the reporting staff of the Sentinel exited the building there were skaters who stood outside the entire night, skates in hand, unable to get it, just watching the building filled with nostalgia. This was a stark difference from the night before, when the rink stayed busy well past 2am and hopes still reigned high that some miraculous entity would swoop in and save the only local skating rink left in Los Angeles. But all the would-be heroes either were no shows or they still circled clad in colorful skate crew tees, their specialized wheels scraping those classic sounds in long arcing strokes, unaware, unable or just ineffective. Only able to do what they knew, one last time, skate. At the rental counter, a white sheet of paper upon which was written plainly, “We are out of skates sizes 6, 7, 8, 9, 10, and 11,” only barely touched the surface of describing the love and respect shown on this last day of skating. Understanding the more than 300 people, of all ages that stood outside the rink, frustrated, because they were prevented from entering only begins to describe the generations of people’s admiration for this classic establishment. This is an end of a legacy, but some looked back to the beginning, like skater Robin Royal, who had been skating at World on Wheels since the day it opened back in 1981. “I remember skating here and all this was new,” he said as he released his wife’s hand and rolled into the swirling crowd. Royal admitted that he traveled from near San Diego to skate here and Skate Depot, another competing rink in Cerritos. 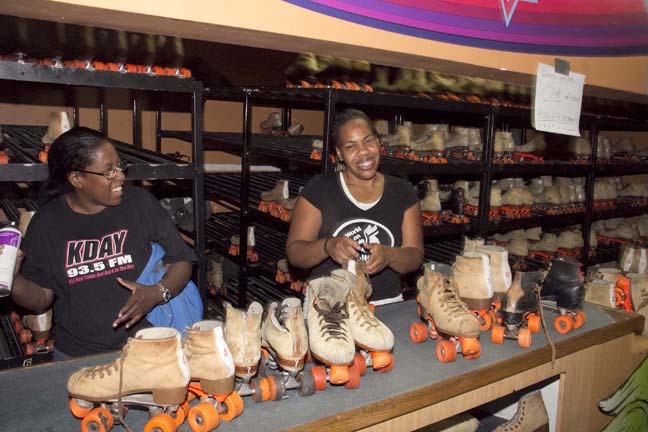 “I come here [World on Wheels] during week and Skate Depot on the weekends.” He added. Reviewing the Yelp.com reviews of the rink is like dipping into a refreshing time capsule as each entry was a step backwards in time and became happier and happier with mentions of the tragic and looming closure becoming eventually nonexistent. The posts described the timeless rink with its colorful skaters, some wild and outlandish, its carpeted walls, two outer corner resting alcoves and its center island commonly used for beginners and dancers. “I LOVE the fact that the beginning skater's section is in the middle - dance party in the center!!!!! !” posted Krista Y. of Los Angeles on July 23, 2012. “The ramps down to the rink are scary fun,” stated Lisa B. back in March of this year, which describe the ‘on-ramps’ on either side of the rink, one of many unique aspects. Another was the fact that the snack and video game area over-looked the skating area with a balcony where parents and friends could watch the skaters go around and around. This aspect also meant the DJ booth with its tented, reflective, glass surface gave the management a clear, elevated view similar to the guard towers in the old jail movies and the loud speaker’s PA system was quick to call out rule breakers. That is a question asked by many as, one by one, establishments once dominated, enjoyed and supported by the African American community slowly disappear from the landscape of Los Angeles like some endangered species. Inglewood Lanes and the Key Club are just a few establishments that have closed its doors, never to open again, to the chagrin of the inner city community. Some question the events that surround the closing of these types of establishments, especially in light of the fact that the police and other entities hovered over the closing like vultures waiting for the last dying breath to escape from the lips of the dreams of Mid-City skaters everywhere. Armed police forces swarmed over the facility on the final day armed with shot guns, brandishing automatic rifles and armored combat suits. They watched as the crowed swelled into a line that stretched like a snake up the front stairwell and around the back and side of the adjacent CVS. Despite the overwhelming and arguably unnecessary police presence, unsavory elements still made their way into the rink lighting cannabis cigarettes and exhaling like it was nothing. Those persons were soon escorted out, or shunned by other skaters, as the management cared more for savoring the positive love for the last day of skating and struggled hard to keep up the traditional rules set that have, for years, kept the rink as a safe place for the youth to hang out, despite the rink sitting in the crossroads of the late 80s and 90s gang wars. During those same times, classic artists like NWA, LL Cool J,MC Lyte, YoYo, Ice Cube and many others graced the rink with concerts and loads of other special events, as well as enjoying many nights of just skating. It is unknown why those same artists couldn’t rally back together to help save the rink as a cultural and Hip Hop Music landmark, as it helped boost many of them to stardom early in their careers. Los Angeles has lost a true historical landmark. For more information on AMF Lanes or World on Wheels, go to www.amfworldonwheels.com.